Walton, K., Williams, P., Tapsell, L., Hoyle, M., Shen, Z., Gladman, L. & Nurka, M. (2013). 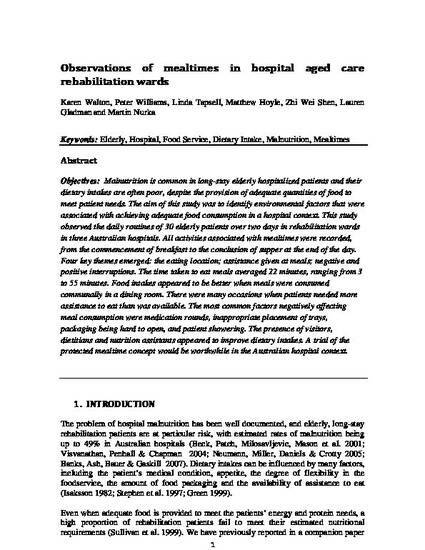 Observations of mealtimes in hospital aged care rehabilitation wards. Appetite, 67 16-21. Malnutrition is common in long-stay elderly hospitalized patients and their dietary intakes are often poor, despite the provision of adequate quantities of food to meet patient needs. The aim of this study was to identify environmental factors that were associated with achieving adequate food consumption in a hospital context. This study observed the daily routines of 30 elderly patients over 2 days in rehabilitation wards in three Australian hospitals. All activities associated with mealtimes were recorded, from the commencement of breakfast to the conclusion of supper at the end of the day. Four key themes emerged: the eating location; assistance given at meals; negative and positive interruptions. The time taken to eat meals averaged 22 min, ranging from 3 to 55 min. Food intakes appeared to be better when meals were consumed communally in a dining room. There were many occasions when patients needed more assistance to eat than was available. The most common factors negatively affecting meal consumption were medication rounds, inappropriate placement of trays, packaging being hard to open, and patient showering. The presence of visitors, dietitians and nutrition assistants appeared to improve dietary intakes. Trials of protected mealtimes in Australian hospitals are certainly important and timely.